I'm happy to report that Hat #24 is in the bag. Or more correctly, it's in the mail. Actually, it's in a bag in the mail. 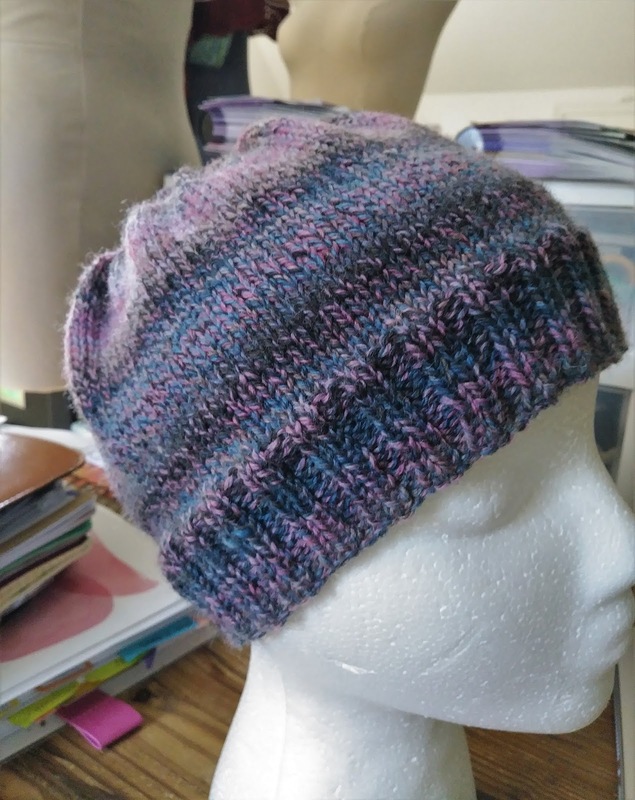 I only need to knit 28 more hats in 2018. Yikes! 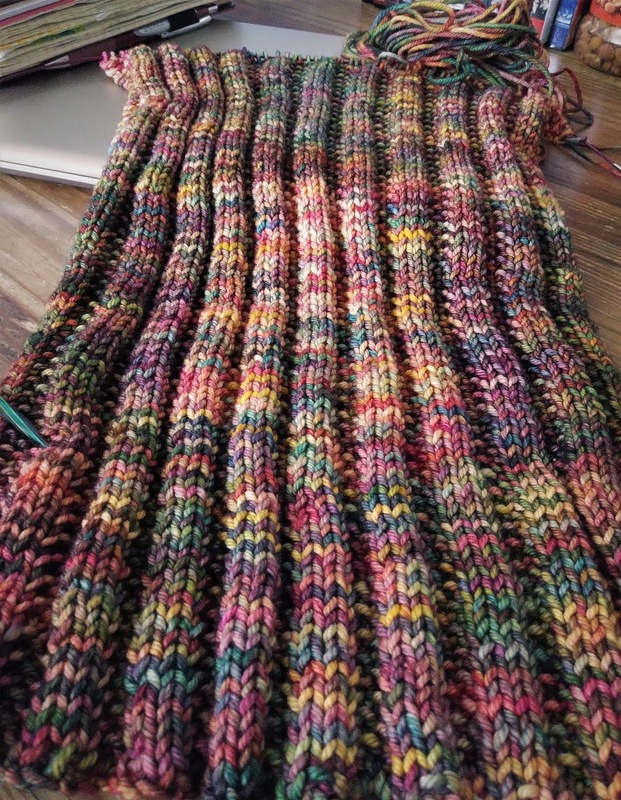 Although it doesn't photograph well, my Noro Cowl is coming along nicely. This photo does not begin to do justice to the yarn or cowl. Besides the fact that it's at a weird length (too long to lay out and photograph, yet too short to drape over the mannequin) my camera simply refuses to produce an accurate image of the colors. I think the autumn yellows, reds and greens are confusing my Nikon. No matter how many adjustments/enhancements I try, the photo comes out either way to yellow or way too blue. You're just going to have to trust me. This yarn is a to-die-for autumny blend of colors. My Coffee Shop cowl is coming along as well. I've reached the end of the stripes, knit a purled turning row, and now I'm knitting the solid color lining. I'd planned to either list this cowl for sale in the shop or put it in the Christmas gift pile but.... I spent a lot of time reading while knitting those stripes and there are a few wonky stitches that I didn't notice until a row or two later and..... But no worries. 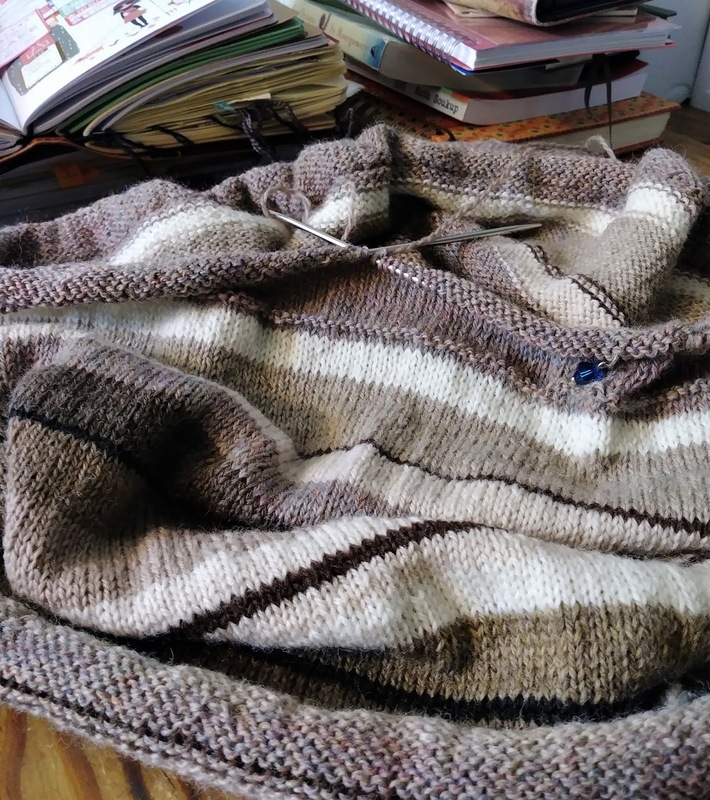 I'll be happy to have a wonky stitched, coffee colored, striped cowl of my own. If you have a creative blog of any sort, please join me in celebrating Makers' Monday by using the link below to share one of your recent posts. That is a pretty Noro. I tend to have bad Noro karma--I always get a color that I think is atrocious! I'm cheating! :) I'm using Malabrigo yarn. beautiful cowl and I hope you sell it quickly! !